In our Volunteer Facilitator Training, we talk about the importance of not using the “Why?” question; however, when we’re thinking about things that are important and impactful in our lives, we should think about the “why” of the things we focus on. By thinking about “why,” we are focused on particular things, and it helps us to dig deeper into what is really important about that topic or issue. This thought has been on my mind a lot lately because of social media. I feel like there is a lot of focus on negative things, or maybe just controversial ones – from bathrooms, to LGBT, to the presidential candidates. There is a lot of negative going through my social media feeds. That got me wondering about why we are drawn to those things and how that affects our ability to actually make a difference on those issues. Those thoughts have led me to work on how I think about these issues and many others. My focus has shifted from the presenting issue to what might be behind those things. What is the surface issue, front and center and big and loud, keeping me from seeing under the surface or behind the scenes? That background issue is what really needs to be addressed! I found this article on Why We Love Bad News that points to research showing that our human brains are drawn to negative things because of our natural survival instinct. This can play out in several ways. Either it is seen as a challenge to be accepted, an enemy or barrier to be overcome, or a possible a distraction to keep the focus off of us. Any of these options make sense to me, but it is only when we recognize them for what they are that we can even begin to move in a direction toward positive work and relationships. As we raise awareness about these things for teens and parents, we can begin to shift the focus off of the surface issue (or distraction) to the deeper, more meaningful need that we as human beings have. What I see in the teens we work with is that their is a desire to defend their side of the issue or simply debate any issue that is brought up exists so that vulnerability can be avoided. So many of these underlying issues are things we all as humans face, but as long as we have something else to argue about, we don’t have to be honest about our core issues and desires. Instead, we can appear to be fighting for a cause or group that needs defending. The truth may be that what really needs to happen is a real, meaningful conversation between both sides so that an understanding is gained on both sides and a resolution and collaboration is able to be agreed upon. As an example, I had the privilege to visit Honduras a few years ago. As an American, I looked at things through that lense. I saw the lack of electricity and people walking and no street lights. But someone said something that got me thinking. What if not having electricity just means you wind down and go to bed when the sun goes down? What if walking means you stay healthier than you would if you drove to work every day? What if no street lights means you really don’t have a choice but to spend time as a family in the evenings? Should that be so bad? Some people I was with felt strongly that we should “fix” all of these issues, but I wondered what “fixing” these issues really meant. This shouldn’t lead us to do nothing. We live in the digital age where we have so much information, it is hard to process it all. that should be empowering, not defeating. We should still share our ides, ask good questions, influence, serve people and vote! But let’s not fool ourselves into thinking that making noise about an issue is what will solve it. Let’s teach a new generation how to invite conversation in a way that is safe and welcoming. Let’s focus on the real issue faster rather than wasting time trying to be right about things we truthfully know little about. Facts may be available, but they can change and they can also be wrong. What is never wrong is listening and helping people in a way that they want to be helped. Not projecting on them what we think their rights should be or defending how we think they have been wronged. Let’s join together to really make a difference and work together to make this world the best place to live that it can be in the here and now. It’s very possible this post will get to you in one of two ways. Either it helps you think through what you should be focusing on or you pushback, not wanting to think about the importance of focusing on the right things. I hope that if it is the latter, you will still give some thought and even share your input to help us better each other. If it is the former, I hope you take time to share this with someone you have influence over or maybe someone you disagree with. So, what do you think? 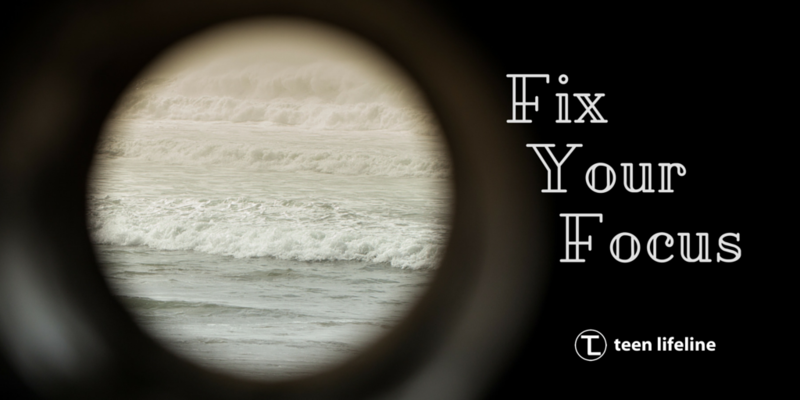 Is there something you’re focused on that needs to be re-focused on the right thing? How have you failed at this or do have a great idea? Let us know!